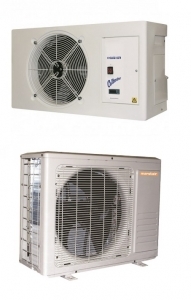 Marstair Low Temperature Split System CXE50 - CKC50 low temperature split cooling system can control down to a lower control temperature than the standard rage, this being 4 °c. This makes it suitable for preparation areas that need to be kept at a lower temperature anmd also wine and beer cellars. Manufactured in the United Kingdom by Marstair these systems offer reliability and a build quality designed to last. This mode is suitable for cooling areas typically of around 42 square metres depending on location.